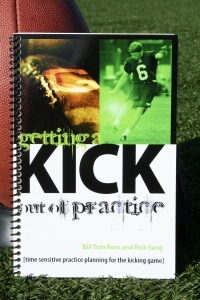 Time sensitive practice planning for the kicking game. The Test of Time is a test that every football coach faces each and every year, especially when it comes to the kicking game. The good thing about time is that it is the one thing, unlike talent, that all coaches have the same amount of. So it stands to reason that those coaches who best utilize their time will have a decided advantage. While all coaches extol the value of the kicking game, the reality is, when faced with the time constraints that all coaches have, the kicking game gets pushed to the back burner and ends up being last on the time priority list. The Test of Time is a test that every football coach faces each and every year, especially when it comes to the kicking game. The good thing about time is that it is the one thing, unlike talent, that all coaches have the same amount of. So it stands to reason that those coaches who best utilize their time will have a decided advantage. Since usage of the time is one element in football that the coach can control, we have been motivated to write this book. Good luck!